CRESTLINE —A Crestline resident and a man from Galion are in jail today on parole or probation violations and are awaiting the possible filing of additional charges. 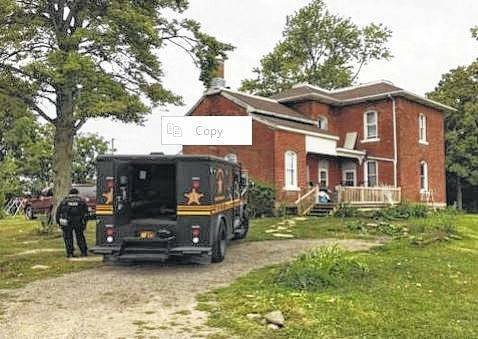 Officers with the Crawford County Special Response Team, assisted by the Morrow County Sheriff’s Office, Metrich Enforcement Unit, the Ohio Adult Parole Authority and Crawford County Adult Probation served a search warrant Friday at 6931 Kile Road in Crestline. Officers recovered suspected marijuana, drug paraphernalia along with numerous stolen items, including a Suzuki four-wheeler, a John Deere tractor, chain saws, weed eaters and more. Two people were taken into custody at the Kile Road address and were jailed at the Crawford County Justice Center, pending the filing of additional charges after the case is reviewed by the office of the Crawford County prosecutor. A 27-year-old man who lived at the Kile Road residence and a 29-year-old Galion man who lives on Eighth Avenue were arrested. The Crawford and Morrow County Sheriff’s Offices are continuing to jointly investigate this matter. Photo courtesy Crawford County Sheriff’s Office Two men were arrested today on Kile Road in Crestline. They are being held on probation violations and could face more charges. Officers reportedly recovered stolen items, drug paraphernalia and suspected marijuana while serving a search warrant. https://www.morrowcountysentinel.com/wp-content/uploads/sites/29/2017/09/web1_Kile-Road-Crestline-Bust.jpgPhoto courtesy Crawford County Sheriff’s Office Two men were arrested today on Kile Road in Crestline. They are being held on probation violations and could face more charges. Officers reportedly recovered stolen items, drug paraphernalia and suspected marijuana while serving a search warrant.